On 9 November 2018, Sevastopol Marine Plant (Sevmorzavod shipyard, branch of Shiprepairing Center Zvyozdochka of the United Shipbuilding Corporation) laid down a non-self-propelled floating crane of Project ПК-700 with lifting capacity of 700 tonnes. 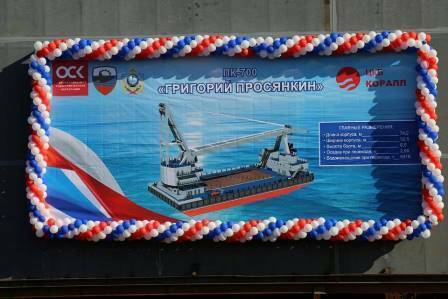 As stated on the company’s Facebook page, the floating crane will be named after shipbuilding engineer Grigory Prosyankin. The project customer - Production Association 'Northern machine–building enterprise' (Sevmash, a company of USC). The project designer - Sevastopol based CDB Corall.